ATM manufactures Waveguide Arc Detectors covering the full frequency range for Rectangular Waveguides, with multiple flange configurations available. Waveguide Arc Detectors are used to detect arcs inside high power waveguide systems. For more information call us and discuss your Arc Detector requirements with one of our design engineers. Atm's series of Arc Detectors are opto-electric devices which detect visible arcs in high-power microwave waveguides. They are normally mounted between the output flange of the microwave source and the transmission line in a 90 degree E-plane bend configuration. Other configurations may be manufactured upon special request. 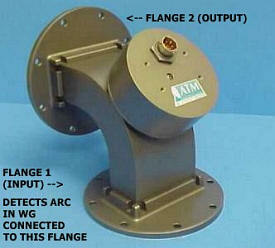 ATM offers Arc Detectors in waveguide sizes ranging from WR28 - WR284. Please call us and discuss your needs with one of our design engineers. In the base model of ATM's Arc Detector, +15 VDC at 25mA is applied to pin A to arm the device. When armed, the arc detector will develop TTL 1 (2.4 - 5.0 volts, 3.5 volts typical) on the output, Pin D. In response to a visible arc in the waveguide facing the detector device (input flange 1), Pin D will have an output of TTL 0 ( 0-0.8 volts ). Pin D will remain at this level until the arc in the waveguide is no longer present. The Arc will automatically re-arm when the waveguide is no longer illuminated. Pins E and F (case ground) are ground connections. Response Time: less than 10 µsec. B - Latching Reset Capability (+5VDC): After being triggered by an arc, the output will remain at less than one volt until the Arc Detector is manually reset. This is accomplished by bringing Pin C to +5VDC (TTL) momentarily, then returned to case ground. BB - Latching Reset Capability (Open Circuit): After being triggered by an arc, the output will remain at less than one volt until the Arc Detector is manually reset. This is accomplished by removing pin C from case ground to an "open circuit" momentarily, then returned to case ground. D - Output Voltage: Output voltage is +15 VDC. This option requires choosing option A, +28 VDC input, The fired voltage is less than 1 volt. Note: For any of the options shown above add the appropriate letter to the end of the model number. It is possible to add more than one option. Example P/N: 137-ARCE-A-2-2 becomes: 137-ARCE-A-2-2/AB when options A & B are desired. See Arc Detector Options table above. More than one option is permitted. ** Bi-Directional Arc Detectors are also available. These can be supplied on 90º E or H bends or on straight section of waveguide. The same options as on the units listed are available.